Learn why content marketing matters, what it entails and how establishing a comprehensive content marketing strategy will revolutionize your marketing efforts. Want a surefire way to drive more organic traffic to your site and increase the return on your marketing investment? Creating a comprehensive content marketing strategy is the most cost-effective and reliable way to draw leads into your funnel, drive more sales conversions and foster stronger, longer-lasting and more valuable customer relationships. Want us to prove it? 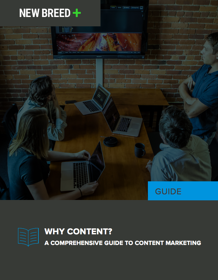 This guide provides a complete overview of Inbound content marketing strategy. To download the guide, simply fill out the form to the right!